pH is a determined value based on a defined scale, similar to temperature. This means that pH of water is not a physical parameter that can be measured as a concentration or in a quantity. Instead, it is a figure between 0 and 14 defining how acidic or basic a body of water is along a logarithmic scale ¹. The lower the number, the more acidic the water is. The higher the number, the more basic it is. A pH of 7 is considered neutral. The logarithmic scale means that each number below 7 is 10 times more acidic than the previous number when counting down. Likewise, when counting up above 7, each number is 10 times more basic than the previous number ². The logarithmic scale of pH means that as pH increases, the H+ concentration will decrease by a power of 10. Thus at a pH of 0, H+ has a concentration of 1 M. At a pH of 7, this decreases to 0.0000001 M. At a pH of 14, there is only 0.00000000000001 M H+. pH stands for the “power of hydrogen” ³. The numerical value of pH is determined by the molar concentration of hydrogen ions (H+) ³. This is done by taking the negative logarithm of the H+ concentration (-log(H+)). For example, if a solution has a H+ concentration of 10-3 M, the pH of the solution will be -log(10-3), which equals 3. This determination is due to the effect of hydrogen ions (H+) and hydroxyl ions (OH-) on pH. The higher the H+ concentration, the lower the pH, and the higher the OH- concentration, the higher the pH. At a neutral pH of 7 (pure water), the concentration of both H+ ions and OH- ions is 10⁻⁷ M. Thus the ions H+ and OH- are always paired – as the concentration of one increases, the other will decrease; regardless of pH, the sum of the ions will always equal 10⁻¹⁴ M ². Due to this influence, H+ and OH- are related to the basic definitions of acids and bases. Acid-base pairs can neutralize each other like H+ and OH- do in this equation. As an operational definition, an acid is a substance that will decrease pH when added to pure water. In the same manner, a base is a substance that will increase the pH of water ⁴. To further define these substances, Arrhenius determined in 1884 that an acid will release a hydrogen ion (H+) as it dissolves in water, and a base will release a hydroxyl ion (OH-) in water ⁴. However, there are some substances that fit the operational definition (altering pH), without fitting the Arrhenius definition (releasing an ion). To account for this, Bronsted and Lowry redefined acids and bases; an acid releases a hydrogen ion or proton (equivalent to H+) and a base accepts a hydrogen ion or proton ⁴. 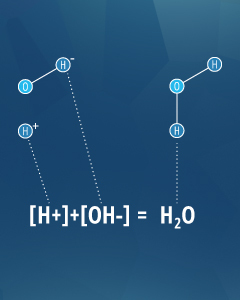 This means that acids and bases can cancel each other out, as shown in the water equation to the right. Common examples of alkalis include milk of magnesia – Mg(OH)2, caustic potash – KOH, slaked lime/limewater – Ca(OH)2, and caustic soda (lye) – NaOH. The terms “alkaline” and “basic” mean approximately the same thing. By the Bronsted-Lowry definition, basic describes any substance that reduces the hydrogen ion concentration and increases the pH of water, or in other words, a base ⁴. Alkaline comes from alkali, which refers to ionic compounds (salts) containing alkali metal or alkaline earth metal elements that form hydroxide ions when dissolved in water ⁵. Alkali salts are very common and dissolve easily. Due to the hydroxide ions they produce (which increase pH), all alkalis are bases. Some sources define any soluble base as an alkali ⁵. As such, soluble bases can be described as “basic” or “alkaline”. However, insoluble bases (such as copper oxide) should only be described as basic, not alkaline. Alkalinity and pH are directly related at 100% air saturation. Alkalinity does not refer to alkalis as alkaline does ⁶. 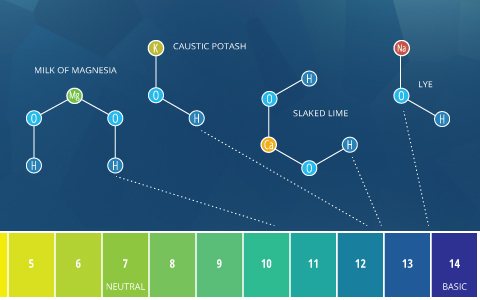 While alkalinity and pH are closely related, there are distinct differences. The alkalinity of water or a solution is the quantitative capacity of that solution to buffer or neutralize an acid. In other words, alkalinity is a measurement of water’s ability to resist changes in pH. This term is used interchangeably with acid-neutralizing capacity (ANC) ⁷. If a body of water has a high alkalinity, it can limit pH changes due to acid rain, pollution or other factors ⁸. The alkalinity of a stream or other body of water is increased by carbonate-rich soils (carbonates and bicarbonates) such as limestone, and decreased by sewage outflow and aerobic respiration. Due to the presence of carbonates, alkalinity is more closely related to hardness than to pH (though there are still distinct differences). However, changes in pH can also affect alkalinity levels (as pH lowers, the buffering capacity of water lowers as well) ⁶. pH and alkalinity are directly related when water is at 100% air saturation ⁹. The alkalinity of water also plays an important role in daily pH levels. The process of photosynthesis by algae and plants uses hydrogen, thus increasing pH levels ¹⁰. Likewise, respiration and decomposition can lower pH levels. Most bodies of water are able to buffer these changes due to their alkalinity, so small or localized fluctuations are quickly modified and may be difficult to detect ¹⁰. pH values are determined on a logarithmic scale. 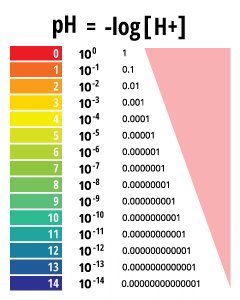 pH values are reported as a number between 0 and 14 as a standard pH unit. This unit is equivalent to the negative logarithm of the hydrogen ion molar concentration (-log(H+)) in the solution. Depending on the accuracy of the measurement, the pH value can be carried out to one or two decimal places. However, because the pH scale is logarithmic, attempting to average two pH values would be mathematically incorrect. If an average value is required, it can be reported as a median or a range, not as a simple calculation ¹⁰. Alkalinity can be reported as mg/L or microequivalents per liter (meq/L). When in mg/L, it refers to carbonate (CO32-), bicarbonate (HCO3-) or calcium carbonate (CaCO3) concentrations, though calcium carbonate is most common ¹¹. Aquatic pH levels. 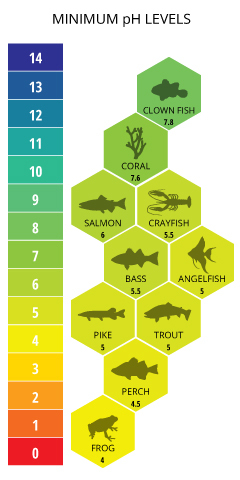 The optimum pH levels for fish are from 6.5 to 9.0. Outside of optimum ranges, organisms can become stressed or die. If the pH of water is too high or too low, the aquatic organisms living within it will die. pH can also affect the solubility and toxicity of chemicals and heavy metals in the water ¹². 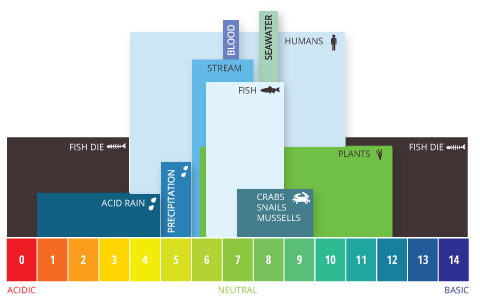 The majority of aquatic creatures prefer a pH range of 6.5-9.0, though some can live in water with pH levels outside of this range. As pH levels move away from this range (up or down) it can stress animal systems and reduce hatching and survival rates. The further outside of the optimum pH range a value is, the higher the mortality rates. The more sensitive a species, the more affected it is by changes in pH. In addition to biological effects, extreme pH levels usually increase the solubility of elements and compounds, making toxic chemicals more “mobile” and increasing the risk of absorption by aquatic life ¹³. Aquatic species are not the only ones affected by pH. While humans have a higher tolerance for pH levels (drinkable levels range from 4-11 with minimal gastrointestinal irritation), there are still concerns ¹⁴. pH values greater than 11 can cause skin and eye irritations, as does a pH below 4. A pH value below 2.5 will cause irreversible damage to skin and organ linings ¹⁴. Lower pH levels increase the risk of mobilized toxic metals that can be absorbed, even by humans, and levels above 8.0 cannot be effectively disinfected with chlorine, causing other indirect risks ¹⁴. In addition, pH levels outside of 6.5-9.5 can damage and corrode pipes and other systems, further increasing heavy metal toxicity. An minor increase in pH levels can cause a oligotrophic (rich in dissolved oxygen) lake to become eutrophic (lacking dissolved oxygen). Even minor pH changes can have long-term effects. A slight change in the pH of water can increase the solubility of phosphorus and other nutrients – making them more accessible for plant growth ¹⁰. In an oligotrophic lake, or a lake low in plant nutrients and high in dissolved oxygen levels, this can cause a chain reaction. With more accessible nutrients, aquatic plants and algae thrive, increasing the demand for dissolved oxygen. This creates a eutrophic lake, rich in nutrients and plant life but low in dissolved oxygen concentrations. In a eutrophic lake, other organisms living in the water will become stressed, even if pH levels remained within the optimum range. There are many factors that can affect pH in water, both natural and man-made. Most natural changes occur due to interactions with surrounding rock (particularly carbonate forms) and other materials. pH can also fluctuate with precipitation (especially acid rain) and wastewater or mining discharges ¹³. In addition, CO2 concentrations can influence pH levels. pH levels can fluctuate daily due to photosynthesis and respiration in the water. The degree of change depends on the alkalinity of the water. Carbon dioxide is the most common cause of acidity in water ¹⁵. Photosynthesis, respiration and decomposition all contribute to pH fluctuations due to their influences on CO2 levels. The extremity of these changes depends on the alkalinity of the water, but there are often noticeable diurnal (daily) variations ¹⁶. This influence is more measurable in bodies of water with high rates of respiration and decomposition. The released hydrogen ions decrease the pH of water¹⁵. However, this equation can operate in both directions depending on the current pH level, working as its own buffering system. At a higher pH, this bicarbonate system will shift to the left, and CO32- will pick up a free hydrogen ion. This reaction is usually minimal as H2CO3 has a low solubility constant (Henry’s Law) ¹⁵. However, as CO2 levels increase around the world, the amount of dissolved CO2 also increases, and the equation will be carried out from left to right. This increases H2CO3, which decreases pH. The effect is becoming more evident in oceanic pH studies over time. 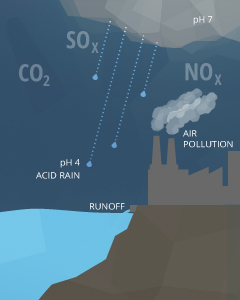 Carbon dioxide in the atmosphere decreases the pH of precipitation. The above equations also explain why rain has a pH of approximately 5.65 ¹⁵. As raindrops fall through the air, they interact with carbon dioxide molecules in the atmosphere. This creates H2CO3 in the raindrops, lowering the rain’s pH value ¹⁷. A pH level of 5.65, though acidic, is not considered acid rain. Natural, unpolluted rain or snow is expected to have pH levels near 5.6, assuming a standard atmospheric CO2 concentration of 0.0355% ¹⁵. Acid rain requires a pH below 5.0 ²¹. 5.65 is also the pH of water that has equilibrated with the air and has not come in contact with carbonate materials or limestone. Carbonate materials and limestone are two elements that can buffer pH changes in water. Calcium carbonate (CaCO3) and other bicarbonates can combine with both hydrogen or hydroxyl ions to neutralize pH¹⁸. When carbonate minerals are present in the soil, the buffering capacity (alkalinity) of water is increased, keeping the pH of water close to neutral even when acids or bases are added. Additional carbonate materials beyond this can make neutral water slightly basic. Limestone quarries have higher pH levels due to the carbonate materials in the stone. 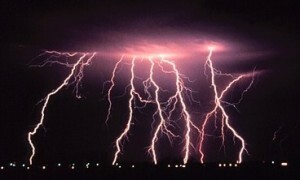 Lightning can lower the pH of rain. As mentioned earlier, unpolluted rain is slightly acidic (pH of 5.6). The pH of rain can also be lowered due to volcanic ash, sulfate-reducing bacteria in wetlands, airborne particulates from wildfires and even lightning ¹⁹. If rain falls on a poorly buffered water source, it can decrease the pH of nearby water through runoff. Decomposing pine needles can decrease pH. 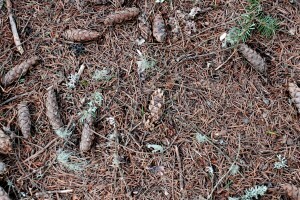 Pine or fir needles can also decrease the pH of soil, and any water that runs over it, as they decompose ¹⁸. Intense photosynthesis increases the pH of water as it removes CO2, though this change is usually diurnal ²⁰. Pollution in the air, soil or directly in the water can all affect pH. Anthropogenic causes of pH fluctuations are usually related to pollution. Acid rain is one of the best known examples of human influence on the pH of water. Any form of precipitation with a pH level less than 5.0 is known as acid rain ²¹. This precipitation comes from the reaction of water with nitrogen oxides, sulfur oxides and other acidic compounds, lowering its already slightly acidic pH. These emissions usually come from mining and smelting operations or fossil fuel combustion (coal burning and automobiles) ¹⁸. 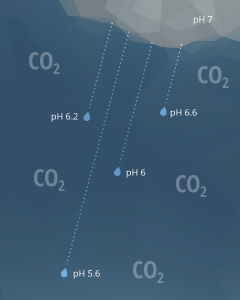 Extremely high levels of CO2 can also further decrease the pH of rain ¹⁷. Point source pollution is a common cause that can increase or decrease pH depending on the chemicals involved ¹⁸. These chemicals can come from agricultural runoff, wastewater discharge or industrial runoff. Mining operations (particularly coal) produce acid runoff and acidic groundwater seepage if the surrounding soil is poorly buffered ²². Wastewater discharge that contains detergents and soap-based products can cause a water source to become too basic. Recommended minimum pH levels for aquatic life. 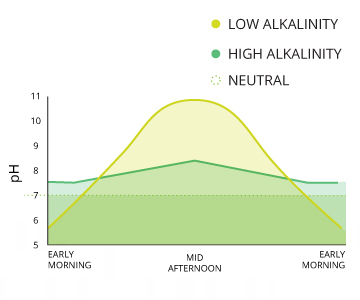 Typical pH levels vary due to environmental influences, particularly alkalinity. The alkalinity of water varies due to the presence of dissolved salts and carbonates, as well as the mineral composition of the surrounding soil. In general, the higher the alkalinity, the higher the pH; the lower the alkalinity, the lower the pH ⁶. The recommended pH range for most fish is between 6.0 and 9.0 with a minimum alkalinity of 20 mg/L, with ideal CaCO3 levels between 75 and 200 mg/L ²⁰. Oceanic organisms like clownfish and coral require higher pH levels. 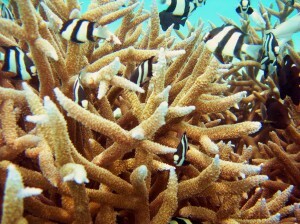 pH levels below 7.6 will cause coral reefs to begin to collapse do to the lack of calcium carbonate ³⁹. Sensitive freshwater species such as salmon prefer pH levels between 7.0 and 8.0, becoming severely distressed and suffering physiological damage due to absorbed metals at levels below 6.0 ⁴⁰. Natural precipitation, both rain and snow, has a pH near 5.6 due to contact with CO2 and other atmospheric influences. Most grasses and legumes prefer soils with a pH of 4.5-7.0, so the slight acidity of rain can benefit carbonate soils ²³. The acidity of the surrounding environment can also affect the pH of water. This is most obvious near mining areas, but the effect can also occur naturally. Acid runoff depletes the water’s alkalinity and lowers pH below optimum levels. This may be tolerable for some aquatic species (such as frogs) but not for most fish. Some frogs and other amphibians can often tolerate pH levels as low as 4.0 ²⁴. Acidic soils in the Amazon cause many of the lakes and rivers to naturally have low pH values ³⁸. Due to the dissolved humic substances from runoff and uptake, “blackwater” sources can have a pH as low as 4.43. “Clearwater” sources will have a slightly higher, but still acidic, pH value ³⁸. That is why angel fish and discus from the Amazon River Basin can thrive quite happily in waters with a pH as low as 5.0 ²⁵. 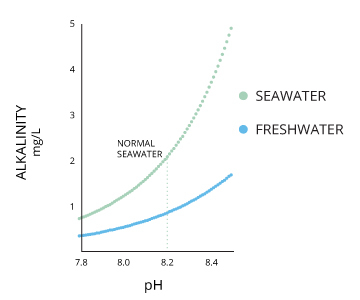 Seawater has a pH around 8.2, though this can range between 7.5 to 8.5 depending on its local salinity. pH levels will increase with salinity until the water reaches calcium carbonate (CaCO3) saturation ¹⁶. The oceans generally have a higher alkalinity due to carbonate content and thus have a greater ability to buffer free hydrogen ions ²⁷. Freshwater lakes, ponds and streams usually have a pH of 6-8 depending on the surrounding soil and bedrock ²¹. In deeper lakes where stratification (layering) occurs, the pH of water is generally higher (7.5-8.5) near the surface and lower (6.5-7.5) at greater depths ¹⁰. Some states, such as Alaska, are attempting to maintain a pH standard for water quality. The Alaska Water Quality Standard requires pH levels between 6.5 and 8.5 to protect the many salmon populations in the state ⁴⁰. Stratification can cause pH levels within a body of water to differ above and below the cline. Stratification is usually caused by temperature differences within a body of water, where each layer of water does not mix with the layers above or below ³⁷. These layers are separated by clines, known as thermoclines (temperature divides) or chemoclines (chemistry gradients). Chemoclines can be based on oxygen, salinity, or other chemical factors that do not cross the cline, such as carbon dioxide. Due to CO2′s influence on the pH of water, stratification can cause pH levels to differ across a cline. 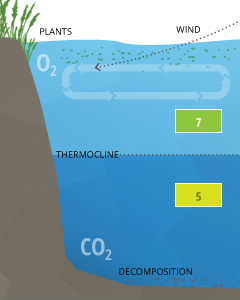 Differences in pH levels between water strata are due to increased CO2 from respiration and decomposition below the thermocline. In crater lakes such as Lake Nyos or Lake Monoun, the pH rapidly drops from a surface level around 7 to 5.5 below 60 m (at the thermocline and chemocline) ²⁶. This significant drop comes from the saturated CO2 that is stored up in the lower strata of the lake. While ideal pH levels for fish are 7-8 (fish blood has a pH of 7.4) ²⁰, most fish can adapt to the pH level of their environment (6.0-9.0) as long as there are no dramatic fluctuations. A dramatic fluctuation is considered a shift in pH of 1.4 (up or down) ²². For saltwater fish, the pH of water should remain between 7.5 and 8.5 ⁹.
Stony corals begin to bleach and deteriorate as carbonate and pH levels fall. Harmful effects become noticeable when the pH of water falls below 5.0 or rise above 9.6. Ill effects due to acidification are more pronounced in saltwater fish due to their adaptation to a higher pH. When pH is below optimal levels, fish become susceptible to fungal infections and other physical damage ¹⁶. As the pH of water falls, the solubility of calcium carbonate is reduced, inhibiting shell growth in aquatic organisms ¹⁶. In general, fish reproduction is affected at pH levels below 5.0 and many species (such as saltwater fish or sensitive freshwater fish like smallmouth bass) will leave the area ²¹. Fish begin to die when pH falls below 4.0 ¹². Heavy metals are more toxic at lower pH levels. Low pH levels can encourage the solubility of heavy metals ¹². As the level of hydrogen ions increases, metal cations such as aluminum, lead, copper and cadmium are released into the water instead of being absorbed into the sediment. 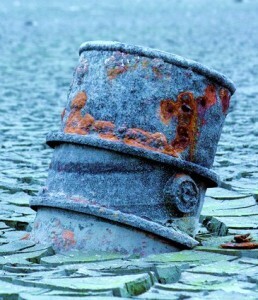 As the concentrations of heavy metals increase, their toxicity also increases. Aluminum can limit growth and reproduction while increasing mortality rates at concentrations as low as 0.1-0.3 mg/L ²². In addition, mobilized metals can be taken in by organisms during respiration, causing physiological damage ²² . This is particularly detrimental to species such as rainbow trout ¹³. Low pH-tolerant algae can form blooms that can kill the lake. Ammonium, NH4⁺, is non-toxic and will not affect aquatic life. However, at pH levels over 9, the equation reverses and ammonia is released into the water ²². Ammonia, NH3, is extremely toxic to aquatic organisms, and as pH increases, the mortality rates rise with the NH3 concentration. On the ecosystem side, mosses can begin invading a body of water as the pH of water falls below 5. 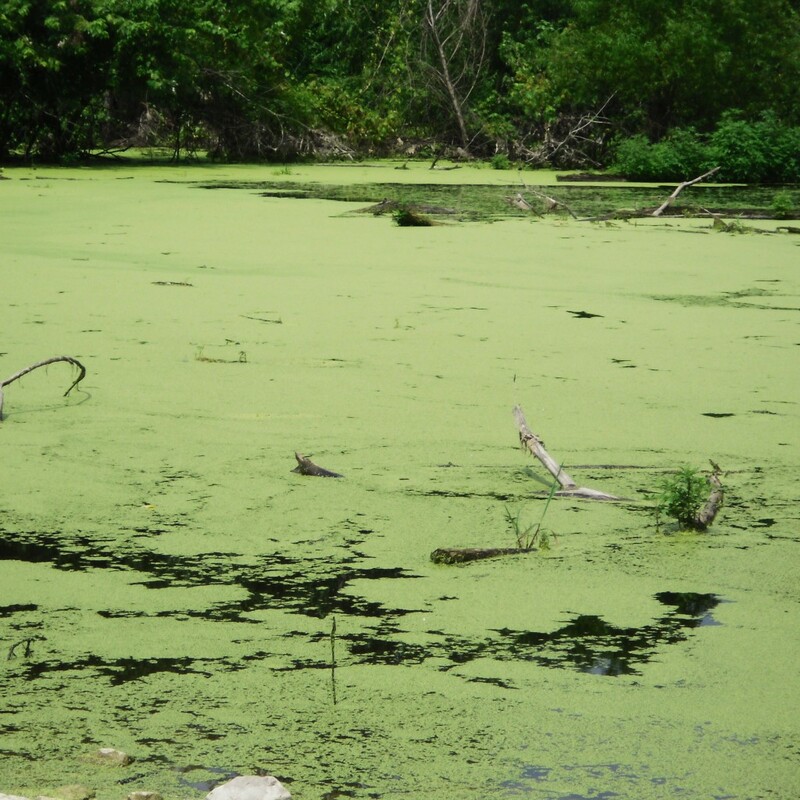 In eutrophic lakes, pH-tolerant algae can dominate, driving the pH levels to diurnal high and low extremes, forming algae blooms that can kill the lake ¹⁶. Spread across the world are a number of lakes with unusual pH levels. Alkaline lakes, also known as soda lakes, generally have a pH level between 9 and 12. This is often due to a high salt content (though not every salt lake has a high pH). These lakes have high concentrations of minerals, particularly dissolved salts: sodium, calcium, magnesium carbonates and bicarbonates ²⁸. Depending on the lake, borates, sulfates and other elements (usually strong base ions) can also be present ²⁹. Alkaline lakes are formed when the only outlet for water is evaporation, leaving the minerals behind to accumulate ³⁰. These minerals often form columns of mineral deposits, known as tufa columns. Many alkaline lakes are a commercial resource for soda ash and potash, while others are popular tourist destinations for their “magical” healing properties (due to the mineral content). A notorious example of an alkaline lake is Lake Natron in Tanzania. Lake Natron has a pH up to 10.5 due to high concentrations of sodium carbonate decahydrate (soda ash) and sodium bicarbonate (baking soda) that enters the water from the surrounding soil ³¹. While the lake supports a thriving ecosystem, including flamingos, alkaline tilapia and pH-resistant algae, Nick Brant, a photographer, has created many haunting images of animals that died in this lake ³¹. The bodies of these animals are preserved by the sodium carbonate, much like the ancient Egyptian mummification process. Acid lakes usually develop near volcanoes, where sulfuric acid, hydrogen sulfide, hydrofluoric acid, hydrochloric acid and carbon dioxide can leach into the water ³². In non-volcanic areas, acid lakes can also develop after acidic deposition from events such as acid rain, pollution or acid runoff from mining operations ³³. Much like their alkaline counterparts, acid lakes have no outlet except evaporation, concentrating the sulfates and acids. The acids can enter the water through atmospheric diffusion from coal burning, acid rain or after an eruption. In volcanic lakes, acids can enter the water through an active fumarole, or volcanic vent. Sulfur and iron deposits at one of Dallol’s acid lakes. The acid lakes at Dallol in Ethiopia are the result of acid leaching from nearby volcanoes. The sulfur and iron in the water leave yellow and rust-colored deposits around the water’s edge. With a pH level below 5.0, few organisms can live in acid lakes. However, there is one notable exception: the Osorezan dace, or Japanese dace. This fish thrives in the acidic waters of Lake Osorezan, resting comfortably at a pH of 3.5, and swims into neutral pH waters only to spawn ³⁴. 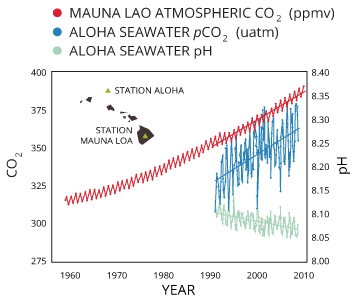 Ocean acidification is caused by an influx of dissolved carbon dioxide. As atmospheric CO2 levels increase due to anthropogenic causes, dissolved CO2 also increases, which in turn decreases the pH of water. When water becomes saturated with CO2, it not only reduces the ocean’s pH, but depletes the calcium carbonate sources as well ³⁵. Calcium carbonate, CaCO3, is a necessary ingredient in building corals, shells and exoskeletons for many aquatic creatures. As CO3²⁻ levels decrease, it becomes more difficult for marine creatures to build their shells. Thus as CO2 levels increase, the availability of carbonate, CO32- decreases, reducing the amount available for shell and coral building ³⁶. At an oceanic pH of 8.3, carbonate levels are high enough for coral building. 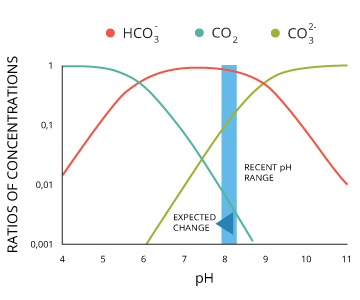 As CO2 increases and pH decreases, carbonate levels will quickly drop below optimum levels. High CO2 levels also make it more difficult to maintain current shells due to lower pH levels and competition for carbonate ³⁵. Furthermore, the air saturation of water is based on partial pressures from Henry’s law. As CO2 levels in the air increase, so too does their partial pressure. This reduces the partial pressure of oxygen, reducing its saturation levels and contributing to hypoxic (low O2) conditions ³⁵. While the oceans will never become “acidic” (with a pH of less than 7), even decreasing pH a slight amount stresses saltwater organisms and increases mortality rates. pH is logarithmic, meaning that a decrease by 0.1 is equivalent to nearly a 30% increase in acidity ³⁵. 7. Wetzel, R. G. (2001). Limnology: Lake and River Ecosystems (3rd ed.). San Diego, CA: Academic Press. 33. Baker, L. A., Herlihy, A. T., Kaufmann, P. R., & Eilers, J. M. (1991). Acid Lakes and Streams in the United States: The Role of Acidic Deposition. Science. Retrieved from JSTOR. 34. Evans, D. H., & Claiborne, J. B. (Eds.). (2006). The Physiology of Fishes (3rdrd ed.). Boca Raton, FL: Taylor & Francis Group, LLC. 37. 11. Boehrer, B., & Schultze, M. (2008). 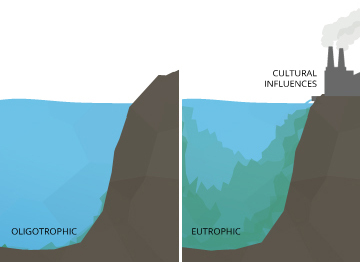 Stratification of Lakes. Helmhotz Centre for Environmental Research -UFZ, Magdelburg. Retrieved from Reviews of Geophysics, Vol 46.